Whether you are looking to hire a function room with its own modern, well equipped kitchen facilities, or for details of forthcoming activities and services available, you will find a wealth of information on what the New Brighton Community Centre has on offer here on our new website. We are a friendly community centre in the heart of New Brighton, that provides a wide range of services and activities for our local community and here you can find out what they are. See what is going on, and find out how you can get involved. Get all the latest news, and find out the many ways to contact us for more details. We hope you enjoy our website and find everything you're looking for. If not, please contact us using the details on this page to get in touch. Thanks, the team at New Brighton Community Centre. New Brighton Community Centre Chair Tony Jones is appealing for local residents to back the Community Centre. He said, "The Community centre is an established venue that has been used by the local community since 1981, generations of residents and families have used the centre over the years for recreation, support and advice. It's always available for use by the general public for meeting, socialising, exercising and learning. It is a charity, run by our voluntary committee of trustees, made up of local residents, who give up their time freely to help the centre continue its support to the local community". Tony Jones continued by stating that; "if you are organising a meeting of some kind, or an event, use the community centre and pay for it. That way you're helping to keep it going. You could also arrange a fundraiser to bring funds directly into the coffers of the community centre". A makeover has taken place in the main activity room, which includes murals and landscapes of New Brighton & Liverpool landmarks, painted by well known local artist Fred Biddulph, with the paint sponsored by AJ Howell DIY of Rake Lane, Wallasey. A new website has also been set up detailing all that's best about the centre, including an archive section stretching back to 1981, maybe you recognise yourself? 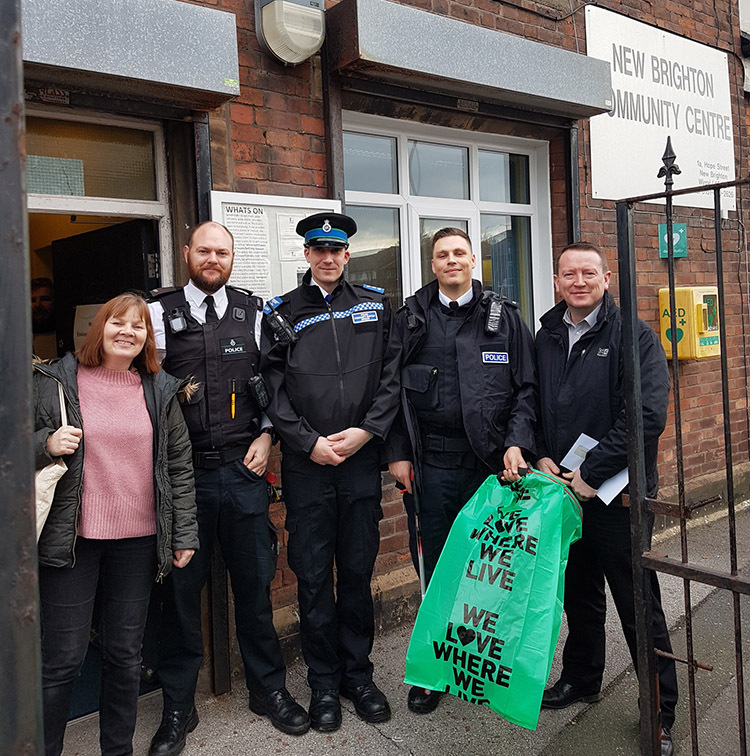 The Community Centre hosted a recent Environment Action Day around the streets of New Brighton with residents receiving a leaflet telling them that they could use a number of skips to get rid of their rubbish. 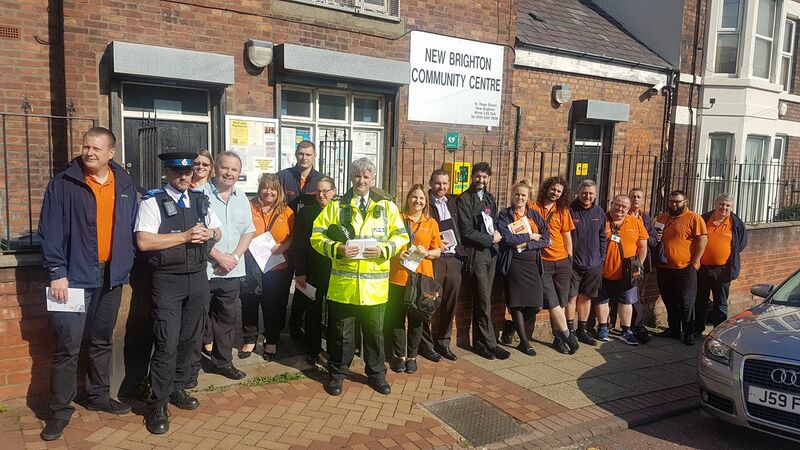 Around 40 partners also went around the streets on a mass litter pick, the picture shows the Police and Cathy Roberts from the Literally bookshop outside the centre about to go off on a walkaround to help clean the streets. We would particularly like to thank Michelle Gray the Wallasey Constituency Engagement Officer at Wirral Council for organising the event and bringing so many partners together for a very successful day that brought so much benefit to the local community. 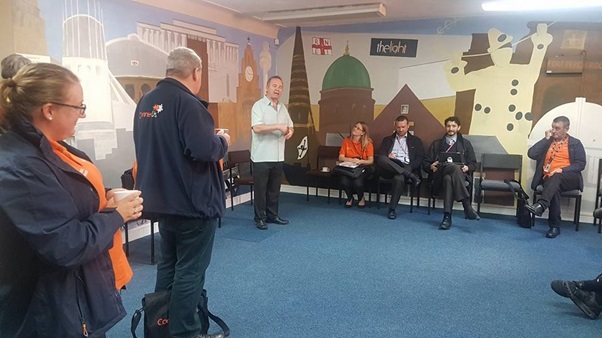 Photographs show Pat Hackett the New Brighton Community Centre Manager promoting and presenting Smart Meter information to partners, including Merseyside Police, Involve North West, Wirral Council Community Patrol and Magenta Housing. 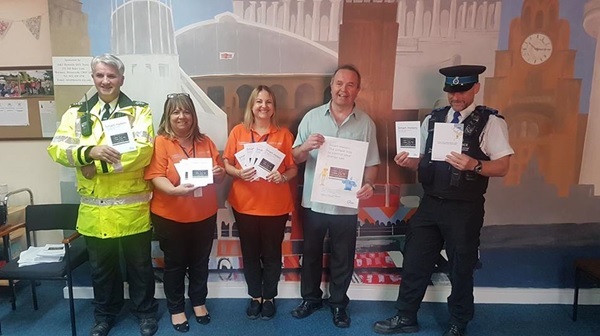 The partners were calling around the area knocking on doors informing people of general information available including delivering leaflets explaining the benefits of smart meters. New Brighton Community Centre needs your help to stay open. Please help us to help you by donating. New Brighton Community Centre has been providing services to the local community since 1981, and you might have been helped and supported over that time. For instance, you might have gone to the youth club back in the 1980s and now have your own family and may wish to contribute. No matter how big or small, just £2 from each resident can make all the difference to enable it to continue for many years to come for the benefit of future generations. The centre has always existed to improve the quality of life for local people by offering excellent services which provide a range of educational, recreational, and social opportunities that meet the needs of the local community.